Several years ago I became interested in dual-purpose or edible landscaping. I noticed how beautiful and fern-like the tops of carrots are and wondered why not border my front flowerbed with them? So I planted a line of carrots against the porch and a semi-circle of spinach next to the sidewalk. Later I planted basil and oregano in the open space. I mulched with straw hay which decomposes and enriches the soil each year. Then I saw some beautiful landscaping shrubs in the plant nursery that displayed colorful berries. So I thought, why not blueberries? I planted two varieties of blueberry bushes in the flowerbed. It’s fun to pick fresh blueberries often to eat fresh and freeze the excess. I even placed a large piece of fat-lighter wood behind the blueberries just for interest. But fat-lighter is a coveted wood for anyone with a chiminea or a wood fireplace. So it will be used for that purpose when the time is right. My dad always said, “If you’re going to plant a tree for shade (or landscaping), it might as well give you something to eat!” So I planted a pair of Jonathon apple trees. These are smaller varieties that only get about 10-ft tall when fully mature. And of course I love my blooming Rosemary. It’s got great evergreen color, pretty purple flowers in the spring & wonderful for both cooking and soap making. I typically mix this plan up each year as I play with the front flowerbed section of my landscaping. It’s lots of fun to change it out each year. And I promise you that stepping onto the front porch to harvest fresh spinach or home-grown carrots for a dinner party is sure to get the conversation going! 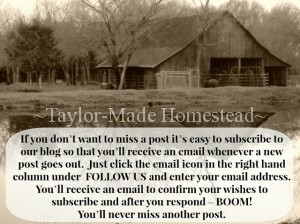 This entry was posted in Blog Posts and tagged Flowers, Frugality, Gardening, Spring on March 5, 2013 by Texas Homesteader. Love it. Fabulous idea. I hope you can keep the critters out! I planted some carrots too a week ago. Nothing up yet. I sure hope they sprout! Thanks for sharing! Have a wonderful day. Fun idea! I’m going to try some container gardening this year I hope! Thanks for joining TTF! Beautiful edible landscaping has been my goal for many years; so far have dwarf fruit and nut trees and a decorative herb garden with a bay tree in the center. Hopefully everything will survive our drought! Thanks for sharing on HomeAcre Hop. I think it’s great for people to be thinking both edible and ornamental at the same time. We did this as we planted trees and shrubs, but not all of it was intentional! We intentionally planted certain fruit, nut and berry trees/shrubs for the food they provide us, but eventually I learned that some of the others we planted, both for ornamental and wildlife value, are edible for people. A great surprise. Your rosemary plant is beautiful. Every time I get one, I kill it. What kind of soil do you have it in? Pingback: Homemade Cooking - How Homeade IS It? Great thoughts! I do the same thing with some flowering herbs in our flower beds (lavender, sage, and hopefully camomile this year) and we have a plum tree as an ornamental tree. Really, fruit trees have beautiful blossoms and great shape if they’re cared for–why not enjoy them around the house?! Thanks for linking up with us for Everything Gardening! Looks beautiful and very similar to what I’ve been doing. Thanks for linking up at Fabulously Frugal Thursday! Hope to see you next time. What a cool idea! Our place is still pretty torn up from recent construction so landscaping will take a while but I will keep this in mind. We grow some beautiful lettuces. Edible landscape, now that makes perfect sense. Food and beauty all at the same time. Thanks! Yes! I love this! I’m not much good at landscaping, so I tend to pretty much just fill the flower beds with vegetables in what looks like the most practical way to me. 😛 I was reading the other day that in some communities, edible landscaping is frowned upon, and sometimes downright forbidden. What? Why?! You’d think in today’s age of everybody going green and trying to solve world hunger and the energy crisis, the HOA would be on board with this. Stopping by from the Eco Kids Blog Hop. What great ideas! We are starting to garden, but only have space for 2 small garden boxes. I am sure we could find room in more random spaces and it will look pretty too.